Hannah Marie Fonder (foreground), Raye Lederman and Olivia Thomas in The Dance of Life. Photo by James Jin. BOTTOM LINE: The Dance of Life is a joyful celebration of the harmony of nature, and a reminder that we are all responsible for protecting it. A dual sense of doom and joy fills The Dance of Life, a dance-based piece by the organization Moving for Monarchs and EarthArt Works. Balanced in the delicate interstitial space between the natural world and civilization, the monarch butterfly is a symbol of freedom and harmony. Yet in the recent past, 90% of the North American butterfly population has disappeared, also casting the orange and black creatures as a symbol of the recklessness of humanity. With little time left, the moment to protect the survival of these crucial pollinators is now, and the stakes couldn’t be higher. The Dance of Life, created and choreographed by Gwynedd Vetter-Drusch (she appears in the show as Mariposa Monarca, a beautiful butterfly incarnate), utilizes ballet-based choreography, video projection, and light storytelling to create a compelling argument for the importance of monarch conservation. Footage of thousands of butterflies nestled against trees and released in the air acts as backdrop to the graceful movement of the cast of dancers, all dressed in black except for the Young Girl (Hannah Marie Fonder), flouncy dress and wide-eyed innocence conveying her sense of wonder. Fonder dances her part with commitment and impressive athleticism, achieving great heights on her many lifts and embodying a genuinely believable child. 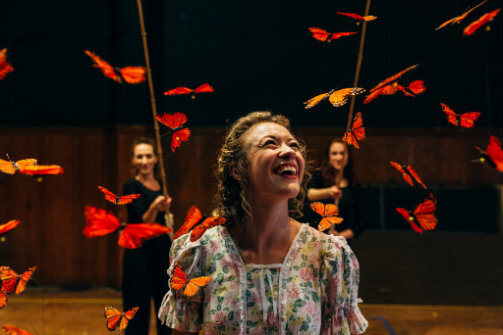 The cast appears mostly with a variety of creative butterfly puppets, including rod puppet flying butterflies and hand puppets. Michael Bishop is a particularly engaging mover, whose lithe motions capture flight beautifully. He and Fonder have a lovely duet—the main narrative section of the show—where the Young Girl meets and learns to love a monarch butterfly. This ends with an emotionally wrought moment of devastation, leading into the story’s message about protecting the earth. Much of The Dance of Life is wordless, though there are moments of truly poetic language with a video of the Mexican poet and environmental activist Homero Aridjis reading from his poem “About Angels IX." There is also a lyrical section of the show describing the origin story of the world in a mixture of Spanish and Engligh. This section, narrated by the somewhat frighteningly masked Abuela Mariposa (Pilar Garcia) strays a bit too far into the abstract; at the performance I saw this was when many of the young children grew restless. In general, The Dance of Life requires a quiet patience, which may challenge its intended youthful audience. Indeed, many of the young people in the audience seemed disengaged at parts, missing the intended message because of the show's pacing. Thematically the show is quite poignant—monarch butterflies fly between Canada, the US, and Mexico, and therefore transcend the borders of North American politics that seem to be so tenuous for humanity. Framing the cause as a continental phenomenon, rather than based in a particular nation-state, serves as a powerful reminder that we collectively share the world and the responsibility to protect it. The essential and unwavering harmony of biodiversity, communicated through the powerful grace of this cast of dancers, is The Dance of Life. The Dance of Life is created and choreographed by Gwynedd Vetter-Drusch. Directed by Jo Vetter. Music by Zoë Keating. Movement and Mime Coach Pilar Garcia. Costume and Mask Design by Maureen Trotto. Puppet Design and Fabrication by Duane Langenwalter and Maureen Trotto. Butterfly Costume Fabrication by Arnold S. Levine, Inc. Lighting Design by Janet Berka. Stage and Production Manager Kaila Hill. Graphic Design by Duane Langenwalter. Social Media by LynMarie Benston and Kaila Hill. Producers Jo Vetter, Gwynedd Vetter-Drusch, Greg Abel. Associate Producer Nicholas Ogaye. Director of Photography Gabriella Garcia-Pardo. 2nd Camera by Jaime Schirmer. Video editing by Holly Buechel. The cast is Hannah Marie Fonder, Michael Bishop, Pilar Garcia, Gwynedd Vetter-Drusch, Maurice Dawkins, Raye Lederman, Kevin Mimms, Elizabeth Dunn, and Olivia Thomas.